Bob Brenly, in Pittsburgh to broadcast a Cubs game, told us that Pennsylvanians are always happy to see him. They think that he's Bill Cowher. 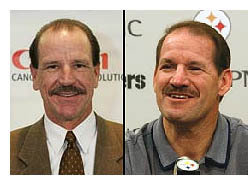 The former Diamondbacks manager (left) does somewhat resemble the Steelers coach (right), but they're hardly twins. Yet Brenly told of a lady in a bar who insisted that she knew what Cowher looks like and that he was definitely Cowher  even after Brenly pointed out that at that moment, Cowher's Steelers were playing on TV. This only adds to my fear that someday an eyewitness will emphatically misidentify me in court as a culprit. In movies, a split screen depicts simultaneous action in different locations. We can choose which rectangle to look at, but we're aware of them all. This also works for audio. There's a scene in Cecil B. DeMille's Dynamite (1929) that combines dialogue, a song, and a building-the-gallows sound effect, all at once. And at my college radio station WOBC, Dickinson Upson once mixed the spoken word, a song, and a howling-wind sound effect. We could turn our attention to any of the elements. I work in the "production" room of television trucks. One wall, filled with monitors, looks like the TV department of a discount store. Facing this wall are rows of desks. I'm generally in the second row, which nowadays looks like the computer department. To my left at the Marlins-Pirates game tonight were another Duet operator with his computer, his coordinator with a laptop, two Fox Box operators, and my coordinator with his laptop. To my right were two EVS replay operators. All eight of us were staring at our individual flat screens and using our individual mice and keyboards. I'm the oddball who's more fascinated by geometry than children. Once, we were televising a baseball game when on our monitors appeared the face of a baby in the stands. The person next to me gushed, "Aww. CUTE!" My response was rather obtuse. Literally. "Awwb. TUSE!" You see, some angles are called . . . oh, never mind. Demanding bosses overuse the word unacceptable. It's okay for George Steinbrenner to say, "This report is unacceptable. Rewrite it. This time, include the earnings projections." Or he could say, "This steak is unacceptable. Bring me another one. And this time, don't overcook it." But what does it mean if he says, "Our team's performance last week was unacceptable"? Are the Yankees supposed to replay last week's games and, this time, win them? No, some things are in the past and cannot be changed. We have no choice but to accept the facts, move on, and do better in the future. 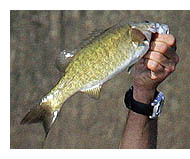 And when the anglers had bad luck, the rivers needed more bass. Opera is tough to understand. You have performers singing at the limits of their range, where consonants disappear and all vowels sound the same. On the radio: Cavalleria Rusticana. The chorus kept insisting, "In den java, Señor!" Does that mean "Into the coffee, Mister"? No, the words were really "Inneggiam al Signore" or "We praise the Lord." I watched two sopranos sing at each other for ten minutes until other characters entered and I gradually realized that the opera was being performed in English. I still couldn't make out half the words. I have a minor complaint about the commonly used Arial font. The lower-case R is too narrow. Above are two unfamiliar names. When they're large, you can tell the difference. But when you have to decipher tiny print sent over a fax machine, as I sometimes have to do in my work, it's not easy. This has happened twice in ten years, so it's time to grumble about it. I'm second in line at the counter, waiting for my turn. They open another cash register, so the woman in front of me goes over there, and I'm now first in line. The Type A personality behind me demands, "Which line are you in?" I'm in the line, I tell him. But he's never heard of the civilized concept of a single line, waiting for the next available cashier. He impatiently moves up beside me to be first in the new cashier's line. On September 11, quarterback Ben Roethlisberger (9 for 11) had a "perfect" passer efficiency rating, 158.3. Perfect, you say? With two incompletions? To keep the rating within a reasonable range of 0 to 158.3, the NFL's formula "caps" statistics: completions, yards, touchdowns, interceptions (all per attempt). If completions/attempt is under .300, the formula uses .300. If yards/attempt is under 3, the formula uses 3. 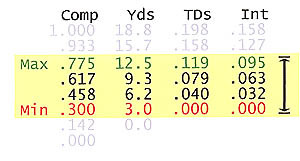 The maxima are .775 completions, 12.5 yards, .11875 touchdowns, and .095 interceptions. Without caps, Ben's rating would be 213.4. A truly perfect passer (every pass a 99-yard touchdown): 831.3. A terrible passer (every pass intercepted): 414.6. The new National Hockey League schedule has increased, from six to eight, the number of games your team plays against each opponent in your own division. To accomplish this, they've reduced travel expenses by almost eliminating interconference play. I don't like it. This season, Pittsburgh plays no games west of St. Louis! And after that game, any Penguins fans in St. Louis will have to wait three years for Pittsburgh's next visit. If I were running things, I would have reduced intraconference games so that every season, each team would play every other team at least once home and away. TV camera operators have to know their sport. A hockey director once asked a cameraman for a shot of Paul Coffey. "Tony, get me Coffey real quick." Tony replied indignantly, "I don't have time to get coffee for you. I'm busy running this camera!" A soccer director, as one team prepared to take a free kick, wanted to show the other team's defensive formation. He said, "Joey, shoot the wall! Give me a shot of the wall!" So Joey zoomed in on the brick wall of the stadium. "Credits" after a TV show are supposed to honor the crew. But sometimes workers ask me to omit their names, because they don't want their regular employer or their union to know they're moonlighting. Then there was the time we were rehearsing a big rock concert. The frustrated stage manager yelled, "Take my name off the credits!" I did not do so immediately, anticipating (correctly) that he would cool down later. My colleague Tom Clark called credits "blame-spreaders." I suggested that if he didn't want Thomas J. Clark associated with a show, we could anagram it to Jack L. Marthos. 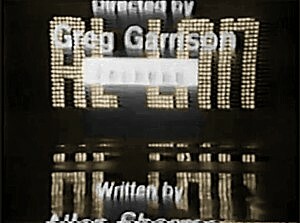 Im not sure whats below Greg Garrisons name, but it looks as though the name of a co-director might have been taped over to escape blame. Later, from 1968 to 2000, the Directors Guild endorsed the use of the pseudonym "Alan Smithee" in such cases. Incidentally, the unorthodox but well-received Allan Sherman special appears to have been recorded in a very cramped studio. Notice in this frame, above Written by, the two horizontal stripes on the shiny floor. Those are conveyor belts. By standing on them, cast members (and small set pieces) could enter the scene from the side. Or by walking opposite to the conveyor's direction of motion, they could remain in front of the camera though they were moving. A clever little device. Similar moving sidewalks were employed at the start of the big finale in the movie Singin' in the Rain. Everyone immediately crowds into the left lane . . . except me. For the next mile, the left lane crawls while I cruise. But when I must merge left, will I be the victim of road rage? In western Pennsylvania, we have a better idea. Now I have official approval to cut in. Because folks are not prematurely abandoning a perfectly good mile of right lane, traffic moves more smoothly.